Over a 15 year period the attachment of stiffeners to roadsigns in the USA, UK, Europe and the Asia pacific regions has been switching from blind riveting to being manufactured with Henrob's special flush finish Self Pierce Riveting process. 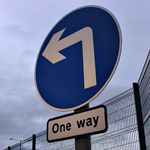 Road sign manufacturing or traffic sign manufacturing quality requirements are increasing to the point where the reflected surface of the road signs or traffic signs has to be free of perforations or blemishes. The only way to achieve this is to stop the drilling of the reflective sign face and switch to the self-pierce option where the signface and stiffener are riveted before the reflective tape or screen printing is applied. Apart from being a significant time saver there are no longer protruding rivet heads that need colour matching to the sign and also the joints are stronger and even used in hurricane prone areas.